The Fashion Studies Alliance (FSA) is a New York-based network and support system for professionals working in the field of fashion studies including academia, archiving, curating, conservation, design, journalism, and research. It fosters collaboration, growth, support and development of individuals and the community. FSA and FSJ are frequent collaborators and boast overlapping leadership. Both groups aim to foster and facilitate the growth of the field of fashion studies in the United States. Learn more about FSA and consider becoming a member here! Photo from the FSA Workshop at Lehman Center for American History at Columbia University. Image courtesy of the author. “You really must love it.” A 2015 study analyzed nearly two million examples of award-winning work in companies around the globe. The results posited that this “great work” was created by individuals who chose to focus their efforts toward an external recipient instead of their own satisfaction. As a Forbes article on the subject summarized: “loving your job is one thing—the activities and responsibilities you have on a day-to-day basis. But loving the impact your job has on someone else is another.”  As educators, the work we do is inherently directed to benefit others. We hope that our contributions will enable someone else to love it. So why would the phrase “you really must love it” sting a bit when we explain our job entails teaching fashion? The Fashion Studies Alliance was curious to know more about our community’s experiences as fashion studies educators, both within dedicated fashion programs, and especially, outside of them. So, with support from the Lehman Center for American History at Columbia University, we sent an open call for participants in a workshop dedicated to the subject of “fashion in pedagogy.” We sought to question current practices and discuss how educators address and/or incorporate fashion into their teaching. Our goal was to work through existing challenges and propose active strategies to resolve them. A group of ten current practitioners and five FSA founders undertook two of the four proposed topics: “defining fashion” and “synthesis in fashion pedagogy.” Two groups debated the complexities of the term “fashion”, settling into a collective agreement that it should be left undefined, as there is freedom without a rigid structure. The myths of fashion and interconnectivity dominated the third conversation but recognized how the conspicuous absences in our oft-retold narratives could become spaces to expand scholarship. In spite of the philosophical nature of these discussions, several strategies emerged from each that could be applied across courses. The groups merged together to share key takeaways and unresolved questions. Are we part of a field or a discipline? A healthy debate ensued without a unified consensus (although FSA has adopted the term field to recognize the diversity of our community). Is fashion a dirty word? We heard about the reluctance of other educators to identify themselves with fashion studies even when they included it in their courses, with a participant sharing that a peer likened it to “entering a mud pit.” Others confronted fashion’s deep association with consumerism and perceptions that the field lacks a critical voice and thus celebrates capitalism. Where do we begin? If we recognize fashion in an ancient Egyptian striped sock and in the varied fur from Otzi’s Copper Age garments, then should we reframe our references to admit a survey of global fashion systems? Power structures were an unavoidable component of every topic, with the obvious feminization of the subject a stated concern and underlying issue. Lower pay rates, lack of professional recognition, and the way fashion is often viewed as an emotional field (like the arts) lead us back to that phrase that piqued our curiosity initially. We really do love what we do, but does that mean we have to accept all of the above as status quo? FSA is expanding this conversation into the public sphere with a State of the Field event, our second in the series to be held in the winter/spring of 2019. We’ll be sharing our actionable tips to use in the classroom, creative approaches to content, and continuing the conversation about teaching fashion. 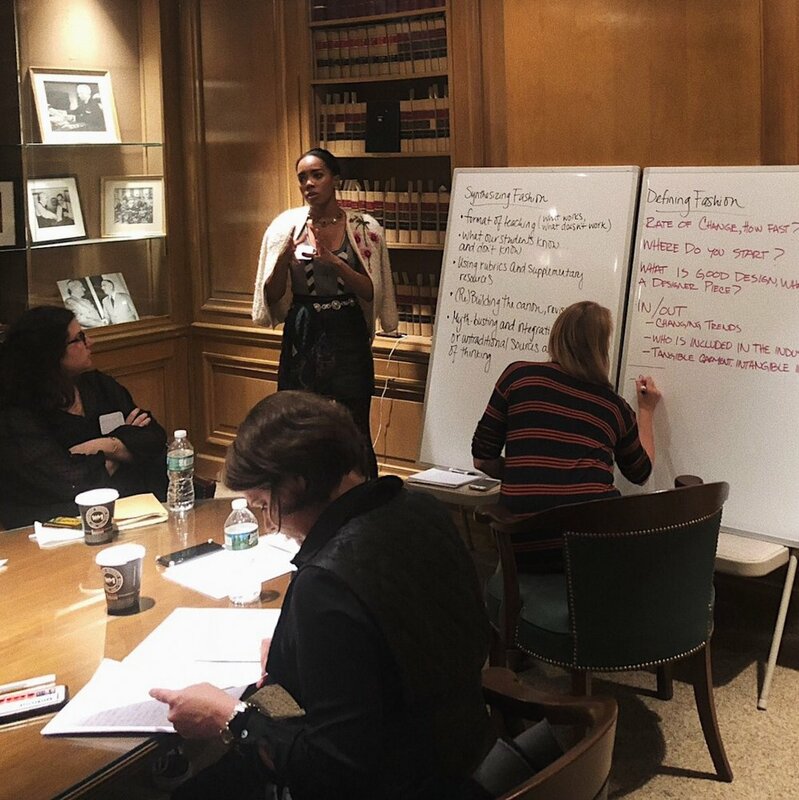 The struggle may be real, but the connections created in this workshop bolstered our commitment to the field of fashion studies. Sarah C. Byrd is a fashion historian, archivist, and educator. Her independent research focuses on early twentieth-century women’s novels and related films, the history of clothing within American cults and communes, and the role of exhibitions in education. She currently teaches courses at the Fashion Institute of Technology and New York University.